Fresh Media's ReMixology with Kris Krüg, moderated by Vancouver Sun's Gillian Shaw discussing TEDxOilSpill from at W2 Storyeum on August 18, 2010. 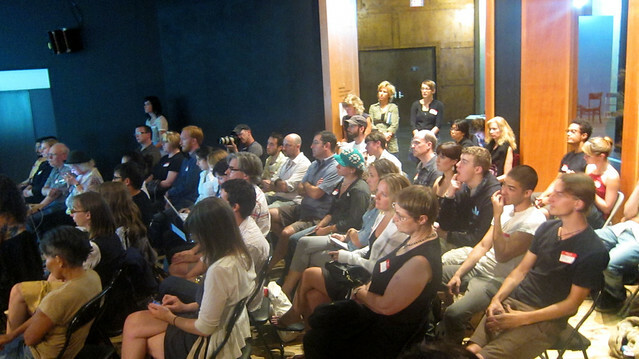 The first ReMixology event held by FreshMedia was a great collaboration and discussion about new media, citizen journalism, and social innovation presented to an eager, diverse, sold out audience. I wrote about first meeting Kris Krug, a local hero of mine while at the CBC. 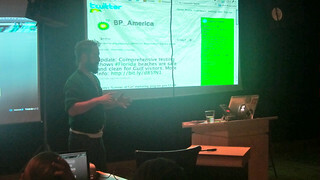 He shared his ideas, passion, and methodology on how he operates as an independent media maker, particularly during his travels to Louisiana and the Gulf Coast during the BP oil spill. Kris famously took some pretty iconic photos for TEDxOilSpill and National Geographic. Since he licenses his work under a Creative Commons, it blew up online and spread a message for a need of further education and information regarding the disaster. 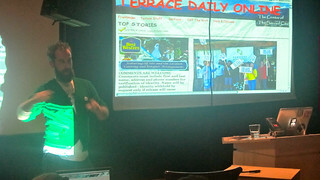 Krüg shared his self-proclaimed hippie ideals and theories on citizen journalism and the importance of making social connections, giving your work away in order to build new models for personable sustainability in order to make a living and educate others as well as yourself while staying relevant. 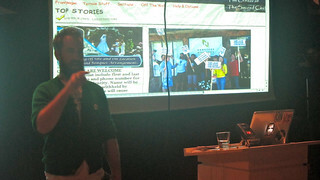 The talk was moderated by digital life writer, Gillian Shaw and The Tyee's David Beers joined the conversation as well. One of the more laughable moments was when a fellow attendee pointed out the presence of alternative media sources but his perceived lack of traditional outlets like CTV, Global, and CBC. Krüg then pointed directly at me and said, "The CBC is here". I then muttered, "I was an intern," to chuckles in the crowd. Krüg in fact showed two separate CBC news stories on him and the oil spill at the beginning of lecture, both done by my mentor, Theresa Lalonde. 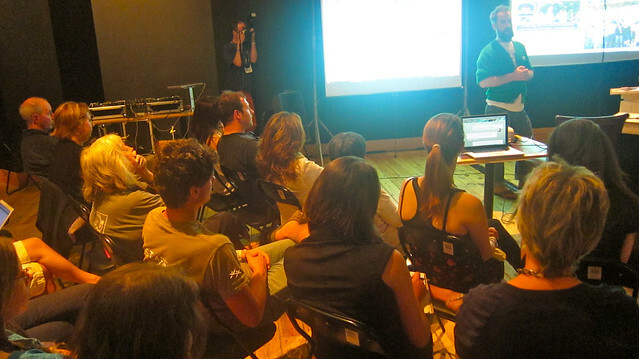 After Krug's talk and a discussion period, local artists and advocates pitched their own media projects and their was a length mixer afterward in the Storyeum, which is a really cool, vibrant space. 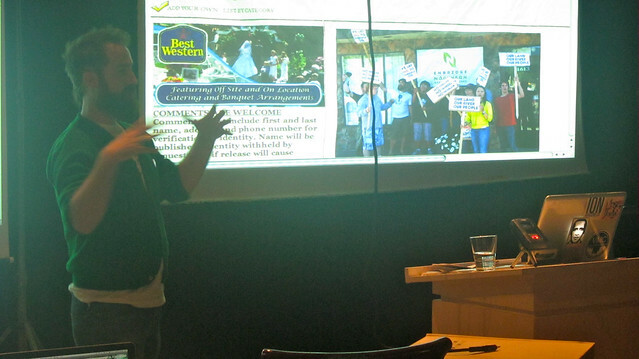 I am really glad I went to the event and had a chance to speak and mingle with some familiar, local media makers. It is still very strange being known in this small, tight knit community. I will never get use to strangers knowing who I am. 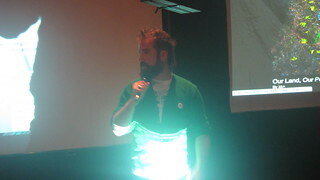 Krüg once again managed to enlighten and illuminate his own experiences in order educate and facilitate collaboration. FreshMedia hopes to hold a ReMixology event monthly with different media minds to encourage local artistic endeavours supporting social change and media innovation. Thanks for writing this Rick. 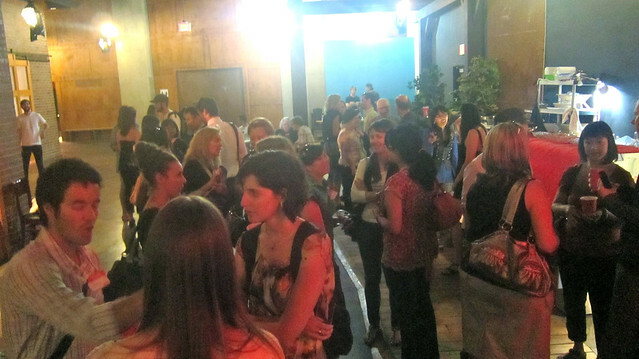 It was a great evening and you captured it really well with your words and photos.